Wheat stem rust (Puccinia graminis f. sp. tritici) is historically the most damaging disease of wheat. The disease has the capacity to turn a healthy looking crop, only weeks away from harvest, into nothing more than a tangle of black stems and shrivelled grains at harvest. Under suitable conditions, yield losses of 70% or more are possible. 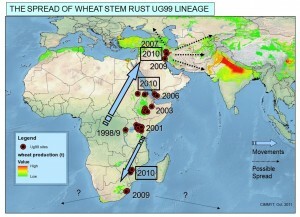 Wheat stem rust is highly mobile, spreading rapidly over large distances by wind or via accidental human transmission (e.g., infected clothing). Rust pathogens change rapidly, often by mutation. Eleven additional variants are now recognized in the Ug99 lineage. All exhibit an identical DNA fingerprint, but differ in virulence patterns. Additional important resistance genes e.g., Sr24, Sr36 & SrTmp have now been defeated by variants of Ug99. 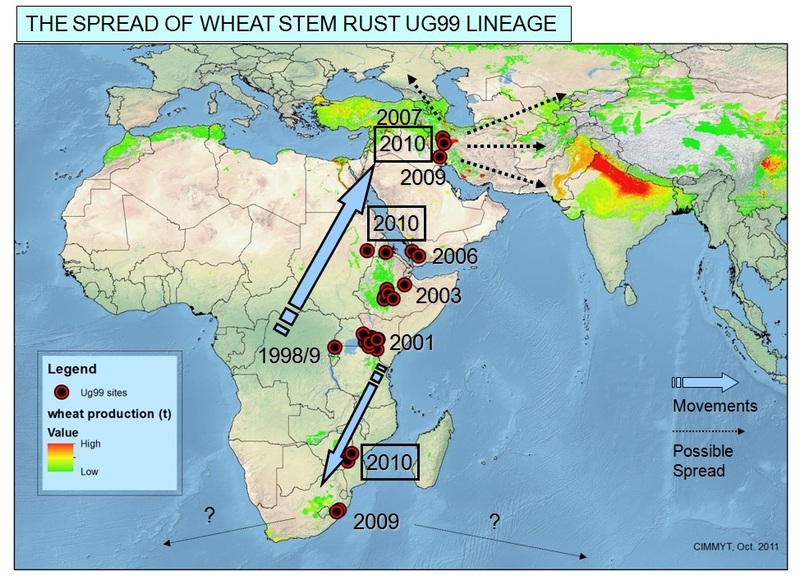 Ug99 or variants are considered a major threat to wheat production with an estimated 80-90% of global wheat cultivars susceptible.